Follow these steps to make cutting your lumber (both board lumber and plywood) easier and to give you better results when building your beehives. Cutting wood with a table saw isn’t difficult, but it surely can be dangerous if you’re not careful. You can manually move the blade up or down to expose more or less of it. You want just enough blade exposed to cut through the lumber. 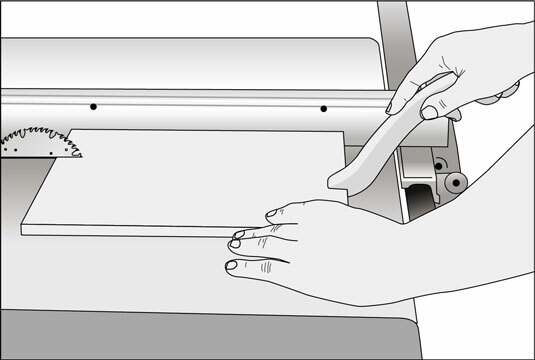 With the table saw off and unplugged, open the blade guard and gauge the blade’s height relative to the thickness of the wood you’re cutting. Adjust the height so that the blade cuts all the way through, but just barely. Exposing too much blade may splinter the wood rather than make a crisp, clean cut. Place the lumber you intend to cut on the table saw. The blade shouldn’t be touching the wood when you fire up the table saw. Allow the saw to run a few seconds to get to full speed before beginning your cut. Doing so is easier on your equipment and also prevents the wood from splintering. Keep the kerf in mind. The kerf is the miniscule amount of wood that’s removed by the width of the blade itself (usually around 1/8 inch). You want to take the kerf into account as you line up the blade with the measurement mark you so carefully penciled on the board. Write an X on the scrap side of the lumber. Position the blade on the same side of the measurement line as the X. If you “erase” that line with the cut, your piece may be a fraction of an inch less than you intended. Don’t rush, and don’t exert force. Using strength to push the wood into the saw can be dangerous. A sharp blade will do most of the work. You’re merely guiding the wood to the blade. Applying just enough pressure to feel the blade working without the sensation of it resisting seems to be right for whatever kind of wood you’re cutting. Alas, there’s no way to develop that feel other than cutting wood and paying attention to the results. Use both hands (always at a safe distance from the blade) to firmly hold your lumber flat on the table and up against the fence. Then guide the lumber to the blade. A push stick is a must when working with a table saw. It keeps your hands away from the spinning blade as you feed the wood closer and closer to the saw. Although you can purchase a commercially made push stick with extra bells and whistles, practical ones are easy to make. Use a piece of 3/4-inch-thick scrap wood cut to fit comfortably in your hand. A notch at the business end of the stick holds the wood as you push it toward the saw. A simple hand-held jigsaw comes in handy for making something like this. A saw kerf cut is the incision made by a saw in a piece of wood. You can use a kerf cut to create a groove or slot in a piece of wood. The width of the resulting cut is equal to the thickness of the saw blade itself (typically 1/8 inch). If your plans specify making a kerf cut, don’t cut all the way through the wood. You simply cut a groove/slot that’s 1/8 inch wide by the depth specified in the plans. Plywood tends to splinter easily, even when you use a saw blade intended for plywood. Here’s a way to minimize splintering: After you mark your cut line with a pencil, use a utility knife to score along the mark. Use a steel straightedge and make a few passes with the utility knife. This breaks the fibers in the topmost layer of plywood and reduces splintering when you make the cut with the table saw.